Slicing your raw chicken into thin strips and arranging them in a single layer on the trays of your food dehydrator before turning on the appliance isn't the proper way to dehydrate poultry, unless you want to make someone sick. 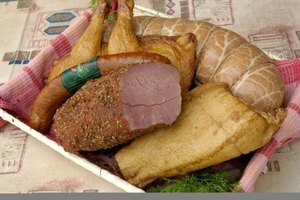 While people have been using dehydration as a form of meat preservation for centuries, it is necessary to take specific precautions when processing poultry. 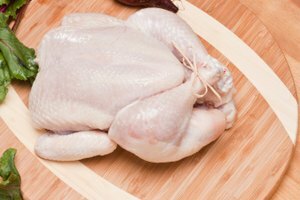 Avoid cross contamination by sanitizing all work surfaces before and after poultry touches the surface. The bacteria on most raw chicken can cause food-borne illness. Cooking kills the harmful bacteria. If you use a knife or cutting board that are contaminated with raw chicken juice to prepare your green salad, you can get food poisoning. When preparing your chicken jerky, wash your hands thoroughly with warm water and soap before and after working with the raw chicken. Do the same with the knives, cutting boards and other surfaces that come in contact with the raw chicken. Home food dehydrators typically come with a user's manual, which includes instructions on drying different types of food, such as fruits, vegetables and meat for jerky. According to the United States Department of Agriculture, when giving instructions on preparing jerky, most manuals leave out an essential step. To kill the harmful pathogenic bacteria found on most chicken, the chicken must reach 165 degrees F. The maximum temperatures of home food dehydrators typically aren't enough to kill the pathogenic bacteria on poultry. This doesn't mean you can't make chicken jerky in your home food dehydrator, but you must first bring the temperate of the chicken to 165 degrees F before drying. This is a step you can do by steam or roasting in the oven before processing in the food dehydrator. Follow the instructions of your food dehydrator when preparing your chicken jerky, but include the step on pre-heating immediately before arranging the chicken pieces on the food processor trays in a single layer, without the pieces touching. After bringing the chicken to 165 degrees F, don't allow it to cool. Put it immediately in the food dehydrator and keep at constant temperature between 130 to 140 degrees F while drying. 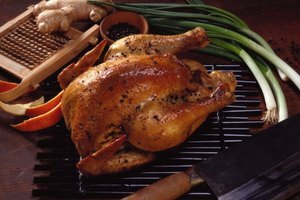 Don't be tempted to reorder the steps; preheat the chicken to 165 degrees F before the drying process, not after. Bacteria is more resistant to heat after drying, and you would in essence be preserving the harmful bacteria. How Long Will Chicken Keep in a Fridge?